Congratulations! 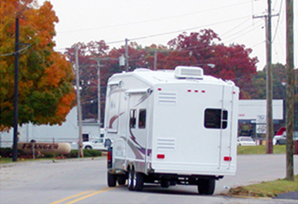 You’ve bought your new fifthwheel from that dealer down the street and you’re about to start out on that trip of a lifetime. 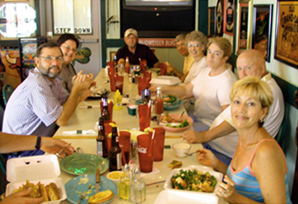 However, there are a few snags - how do you backup? Drive around that tight corner? Turn the propane on for the fridge? Maintain the slide-out mechanism? 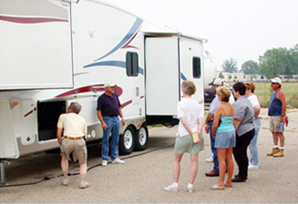 We sell to all sorts of RVers - from the most experienced to the totally novice, and we want to be sure that every one of them understands everything about his new fifthwheel before he heads out. So, we have devised a totally unique and comprehensive check-out system. 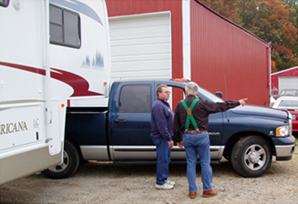 To begin with, we take the new owners through every system in their new Americana - as many times as it takes for them to understand exactly how everything works. Then we goes through hitching and unhitching. Again, until the new Americana owners can pretty much do it blindfolded! 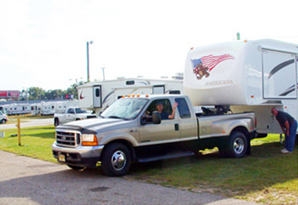 And then -- the new owner climbs behind the wheel of his truck and we instruct both husband and wife in all phases of towing a fifthwheel, from going forward to backing into that tight space; from using mirrors to turning the truck 90º from the fifthwheel without having the Americana fifthwheel move at all! 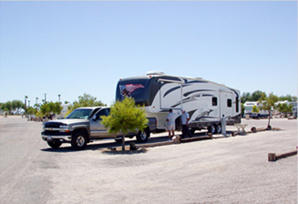 After all this, it’s off to the campground in Elkhart - or in Bullhead City Arizona, if that’s where it’s more convenient to pick up the new Americana - for at least overnight. There every system gets a good shakedown, and if anything goes wrong (and Murphy’s Law says that something will! 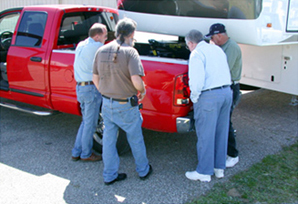 ), the next day our mechanics are right there to fix it. 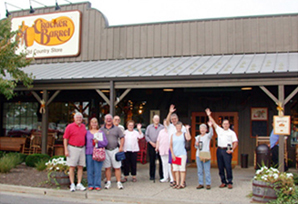 The group of owners and shoppers, who are ready to look over shoulders to learn about the Americana, say “hi” after a good breakfast and before heading for the upfitting center for a busy day of learning the ropes. Mike, from Southern California, heads for the driver’s seat. Russ is ready to ride shotgun. Off we go! Heading out for that first driving lesson. 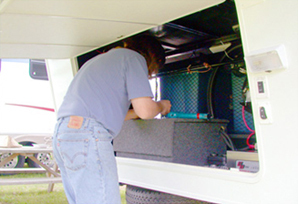 Adjusting the Wainwrights’ air ride levelling system at the Avi Campground. 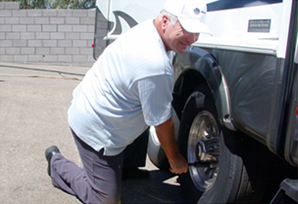 In Bullhead City Arizona Texan Steve Wainwright, as instructed, checks out his lug nut torque and tire air pressure before heading out. 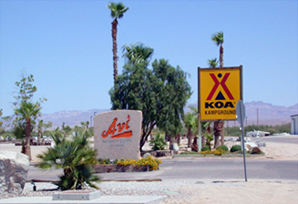 An oasis in the desert – the Avi Campground in Arizona, where our new owners spend the night after their checkout in Bullhead City. 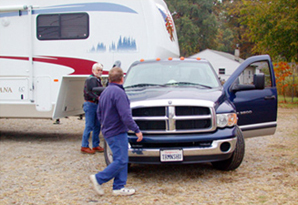 Dan the mechanic fixes a problem at the Elkhart campground.